I created my own executable using AutoIt. It's called MyHelpDesk.exe. So, I would like to know a way to use those two new options, but I don't want to use helpdesk.txt file because I have my own UI created from Autoit. That's why I asked how to use those options from commanline mode. Would it be possible to use those options with my own UI? I removed all the unnecessary options, but when I run winvnc, it still displays the default UI. I need to know not showing the builtin UI. One most requested feature these days. These days, so many people uses multi-monitors. Especially traders use many monitors with one PC. So, SC is desirable to support multi-monitor connection like TeamViewer. Do we have at least some solution for this feature request? I can see -dis_uac and -en_uac options supported even though I still don't see -wallpaper option. However they only manages registry keys and returns without doing anything else. Rudi, would you be able to add both -dis_uac and -wallpaper as command line options so that I can embed SC into my own UI rather than one created based on helpdesk.txt? where MyIP will be obtained from my own UI. I thought this would reconnect on a temporary internect failure, but it never reconnected. Please tell me what is missing to use autoreconnection feature. 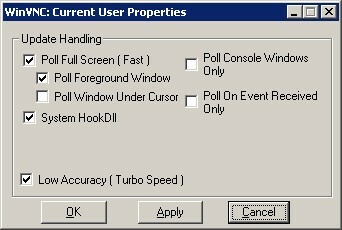 Is there a way to run with checked Poll Window Under Cursor? Default can't be changed, it's hard coded.